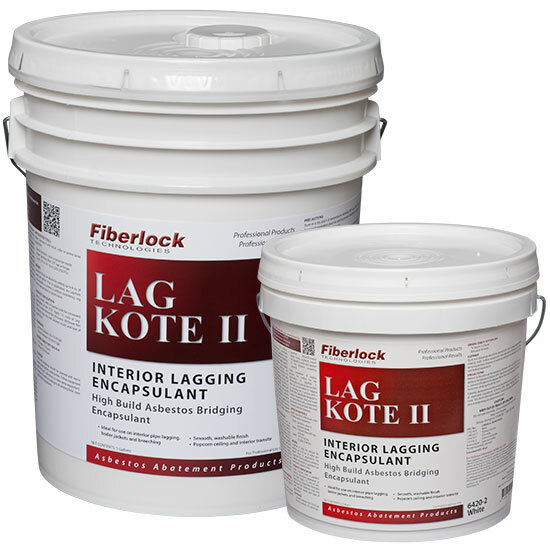 Lag Kote II is specifically formulated for application over interior Asbestos Containing Material (ACM). It is ideally suited to encapsulate interior pipe lagging, boiler jackets, breeching and other components of heating and ventilation systems. It minimizes dripping, cleanup and product waste while providing a smooth, washable, aesthetically-superior finish that prevents the release of harmful asbestos fibers. Patching Cement: Mix cement with water and cap all exposed ends and voids. Lag Kloth Water-Activated Repair Cloth: Lag Kloth should be dipped in water and applied to the asbestos containing material. Upon completion of repairs, prepare the surface for the application of Lag Kote II. Thoroughly remove all dust and dirt that has accumulated on lagging or covering, use a vacuum with a HEPA filter specifically designed to capture hazardous dust and waste or wipe surfaces with a damp cloth. Do not air clean surfaces; this could increase asbestos exposure. Apply Lag Kote II with brush, roller or airless spray equipment. Lag Kote II may be diluted by adding up to 10% water. Prior to application, stir Lag Kote II thoroughly to achieve a uniform consistency. Lag Kote II can be tinted to pastel colors. Select a brush, roller or painter’s mitt for convenient application to the ACM. Apply 1-2 coats of Lag Kote II to the desired film thickness. Minimum film thickness may vary with desired results and type of application. Store in a dry place at temperatures between 40°F (4.5°C) and 90°F (32°C). When applying with a sprayer, wear a NIOSH approved respirator with any R, P, N or HE filter. Approved respirators must be used to prevent inhalation of asbestos fibers that may be present in the air. Protective clothing should be worn. Careful consideration must be given to all EPA, OSHA, federal, state and local regulations in effect prior to the application of this product.